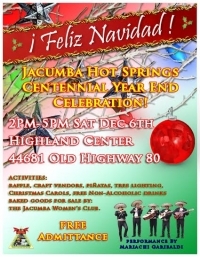 November 21, 2014 (Jacumba Hot Springs)--Jacumba Hot Springs closes out its centennial year on Saturday, December 6th with a Feliz Navidad celebration. 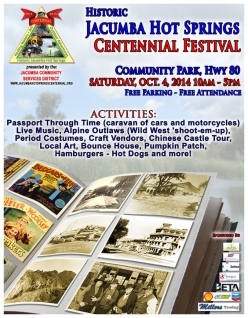 The event takes place at the Highland Center, 44681 Old Highway 80 from 2-5 p.m. Admission and parking are free.